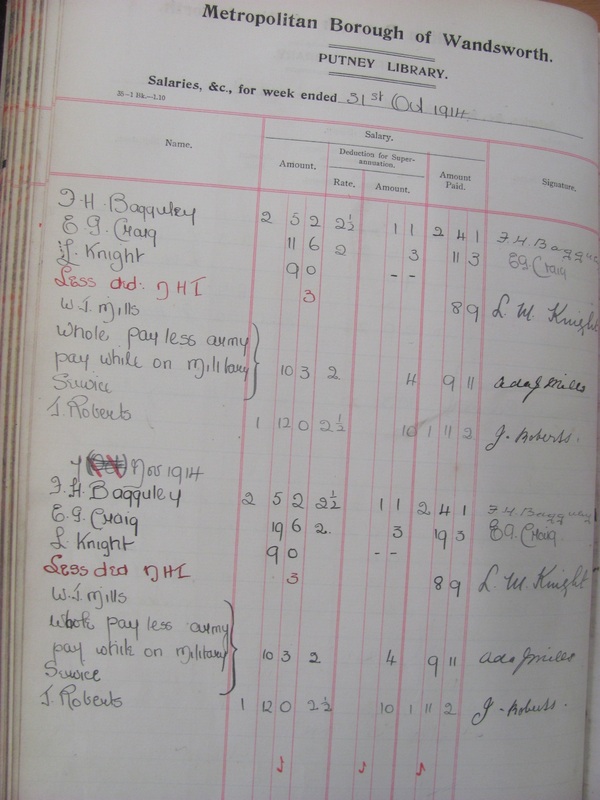 The log book of the boys school at Putney St Mary’s School is divided into several sections, each recording different aspects of school life that the standardised book thought were important. Some of these are in the miscellaneous section and details visits to the school, school holidays and other special occasions. 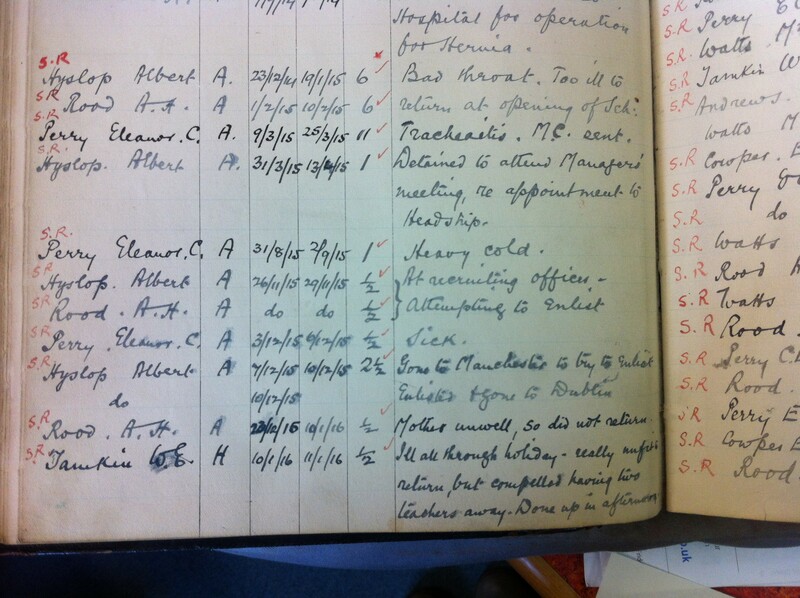 For November 1915, the only two events recorded in this section were a visit from the Nurse to examine all the boys and a visit from Dr Verdon Roe to carry out a medical inspection. 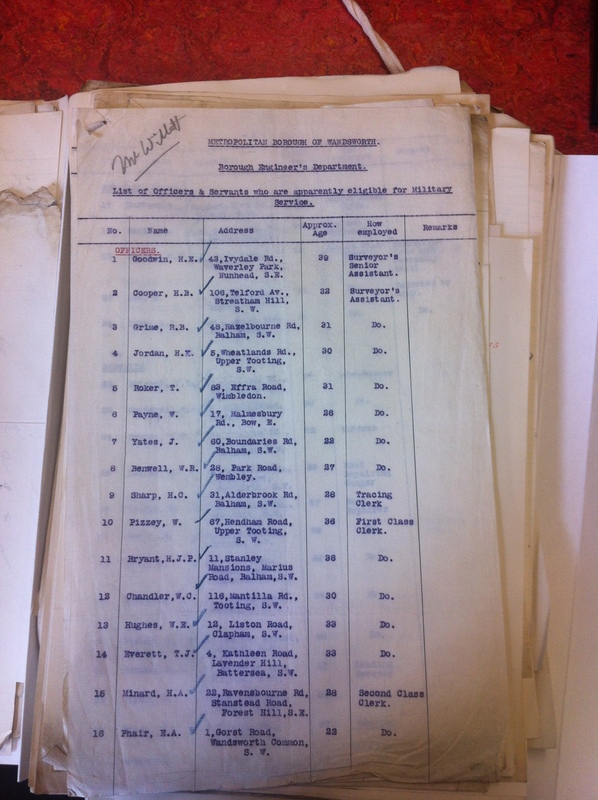 Other sections give more insight into the life of the school – the recorded absences for teachers this week notes that Albert Hyslop and A H Rood were absent for half a day as they were “at recruiting office – attempting to enlist”. This was obviously not a successful attempt, as on 7th December Albert Hyslop was again absent, having “Gone to Manchester to try to enlist”. 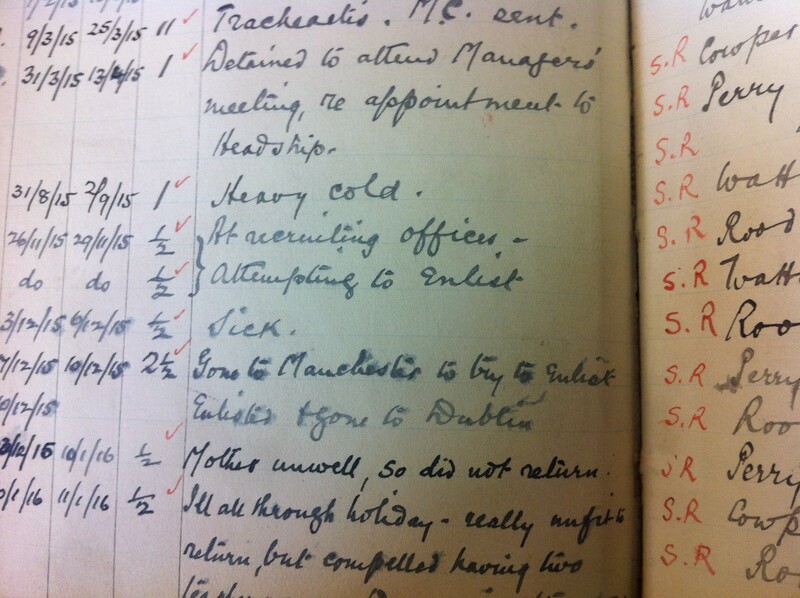 A H Rood continued at the school throughout the war, but Albert Hyslop’s trip to Manchester was a success – his marked absence and recorded last day as staff on 10th December carry the note “Enlisted + gone to Dublin”. It is possible that A H Rood was ineligible for service due to health reasons, in March 1916 he was absent as having been called up for a medical exam by the military but as he wasn’t subsequently called up to service we could guess that he failed it. Hyslop’s absence meant that the Head Teacher was “obliged to take charge” of his class. 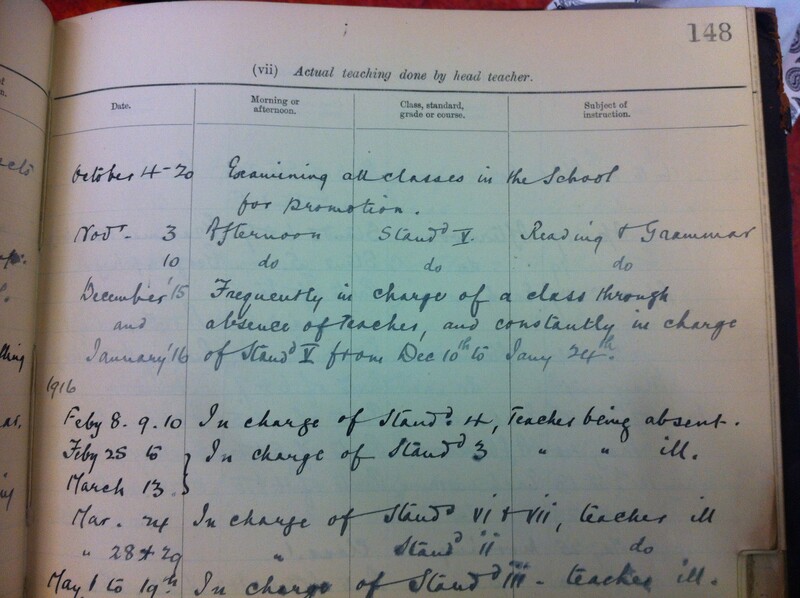 Another part of the log book records how often the Head Teacher taught, and through December and January he is noted as frequently in charge of a class through the absence of a teacher, as well as being in “constantly in charge” of the whole school. Eventually a new teacher was transferred to the school from Brandlehow School for the duration of the war – Mrs Evelyn Faulkner. Elsewhere in the borough, a meeting was held of Battersea Borough Council. They too were dealing with issues around staff joining the Forces, a new Group system of recruitment was coming in (the Derby Scheme) which meant they had to consider if staff joining up through that should receive the same benefits as those who had joined up earlier. The recommendation was that they should, if they joined up before 4th December. Staff now had to be given permission to join up, and at the meeting three men were granted it – W Marsh, public lighting attendant, A J Spriggs, coal trimmer, and G Wright, groundman, Morden cemetery. The Derby Scheme recruitment will feature more next week, and in weeks to come, as we look at the Military Service tribunal records. The Wandsworth Borough News of 17 September reports on 70 wounded soldiers being entertained at Winchester House, which was the Putney Constitutional Club. The soldiers came from Gifford House, which was being used as an auxiliary hospital from King George’s Hospital at Waterloo. Entertainment included tobacco or cigarettes on arrival, followed by bowls or billiards. Prizes were pipes and tobacco and there was then a concert, including singing, “humorous sketches were immensely enjoyed”, recitals and “exceedingly clever ventriloquist sketches”. When the soldiers reached their transport, more cigarettes were apparently showered on them, having been bought specially by club members. 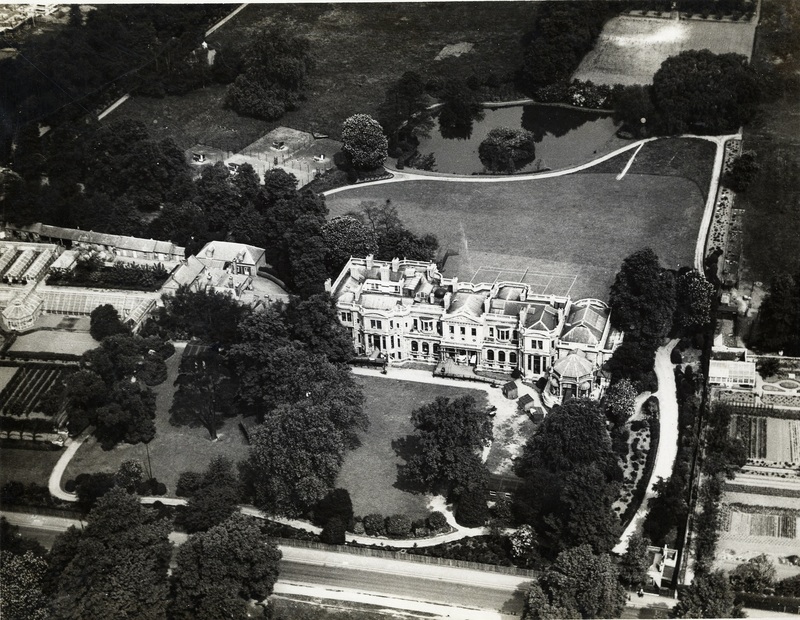 Gifford House was a mansion on Putney Heath, the site is now part of the Ashburton Estate, bordered by Innes Gardens, Tildesley Road and Putney Heath. The house was originally built around 1760 and had a range of occupiers, including James MacPherson and Baron Charles Joachim Hambro, before being purchased by the Charrington brewing family in 1892. The Charringtons carried out extensive remodelling of the house, including adding the ballroom for 120 people, but moved to Ashburton House around 1910. The Duchess of Westminster occupied briefly around 1913, but the house appears to have been empty when it was offered up as a location for a hospital. Gifford House continued to be a hospital until 1919, when it became the Queen Alexandra Hospital and Home for Discharged Soldiers In memory of Lady Ripon”. It formally opened under this name on 9 July 1919 and stayed until 1933, when it moved to Worthing – where it remains. Many of the QAHH’s old photographs are available online here. Wandsworth Borough News available on microfilm. At the end of September, the Putney Relief Fund made its first payment, (see this post for details). Since then the numbers applying had dropped, the meeting on 14th January 1915 had 9 applications to deal with – considerably less than when the Fund first opened. One of the names was still the same, Alice Barham had originally been given some money until her sons in Canada could be contacted, but at the end of October she had to apply again and was being granted 2/6 per week. The Committee recommended that she contact her son at Salisbury but had been granting her a weekly allowance ever since. On 21st January this was suspended for the time being, her name does not re-appear in 1915 and there is no record as to why they stopped the allowance. Hopefully one of her family was able to help her or she managed to obtain work. Other applicants had to find work, Mary Brown’s case had been adjourned from the previous week until the Committee heard from her employers – presumably to ensure that her hardship was due to the war. A workroom had been set up at the Wesleyan Central Hall in Tooting and employment was to be obtained for her there. One case, that of Mrs Featherstonehaugh, was eventually referred to the Central Committee for the borough and then to the Committee at Assington. Assington was presumably where the headquarters of the Prince of Wales Relief Fund was based. Interestingly, unlike all the other applicants, Mrs Featherstonehaugh is only ever referred to as such – all other applicants are referred to using both names – and she received more support than the majority, getting £1 a week whilst the most received by another applicant this week was 13s. Her full name was Emily Featherstonehaugh, she lived in Warwick Mansions on Lower Richmond Road and her husband Thomas was a commercial agent for silk. Full case details are not given in the minutes, so it is impossible to tell what caused difficulties for any of the applicants – it could be that business dried up due to the war, or that men who joined the Army were not able to send pay home immediately. The Committee was very clear that distress which was not caused by the war was not their responsibility, any applications which they deemed to fall in to that category were turned down. The Putney Committee also reported on matters decided on by the Borough Executive Sub-Committee with other issues relating to who received money. The question over how to deal with men who had served for a short time then discharged from the Army as unfit was reported as having been referred up to the Central Committee for a decision. 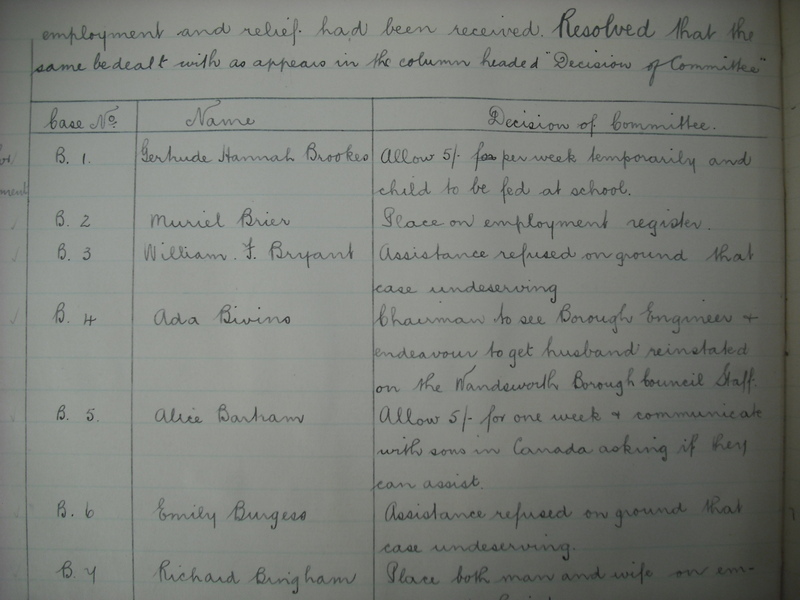 If applications from men who had been employed in hut building were received by the Ward Committees then they were recommended to refer the men to the Distress Committee as relief works were being opened. The minutes do not say what the “hut building” was, nor do the minutes of the Executive Committee – although there were earlier notes of men being given work to do in clearing vacant land for cultivation. It is possible that the huts were for the 3rd London General Hospital, but there is no evidence to back that up. Over the last few weeks there have been a lot of mentions of the Prince of Wales National Relief Fund and the local Relief Funds. Each borough set up committees as part of the national effort, which co-ordinated local collection and distribution of relief, or money to help relieve hardship caused by the war. Wandsworth Heritage Service only holds one local committee book, for the Putney Ward, and so far committee meetings had been very much administration and fundraising related. The Putney Committee met in Putney Library and was chaired by Alderman Lindsey, with members including Eileen Lecky (see here for more about her and her work), the local councillors and Rev Canon Rivington, vicar of St Mary’s Putney. A register of assistance had been prepared and enquiries made round all the charitable organisations in the area to gather more information. In order to deal with applications for employment the committee had started to use the windows of the Board Room in the Library to advertise vacancies for temporary servants and charwomen. 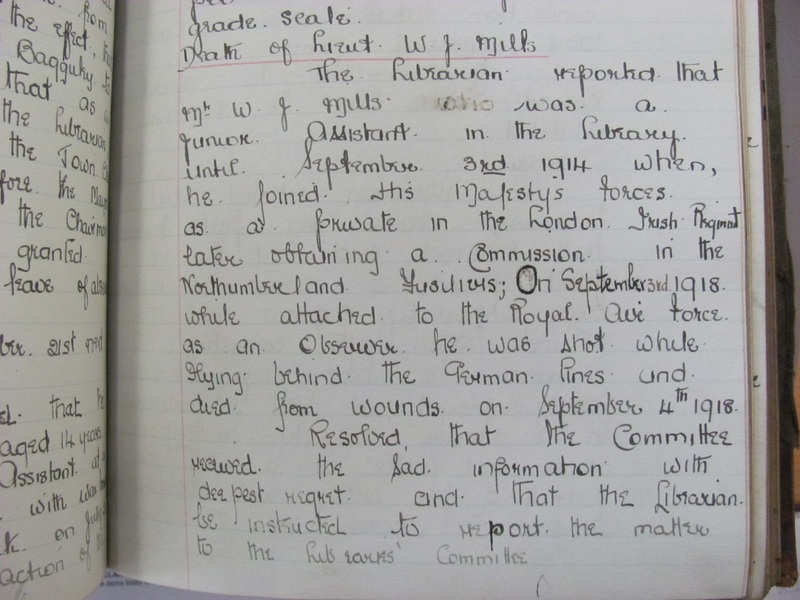 The local committee met on October 1st and the minute book records the first applicants and the decisions made. 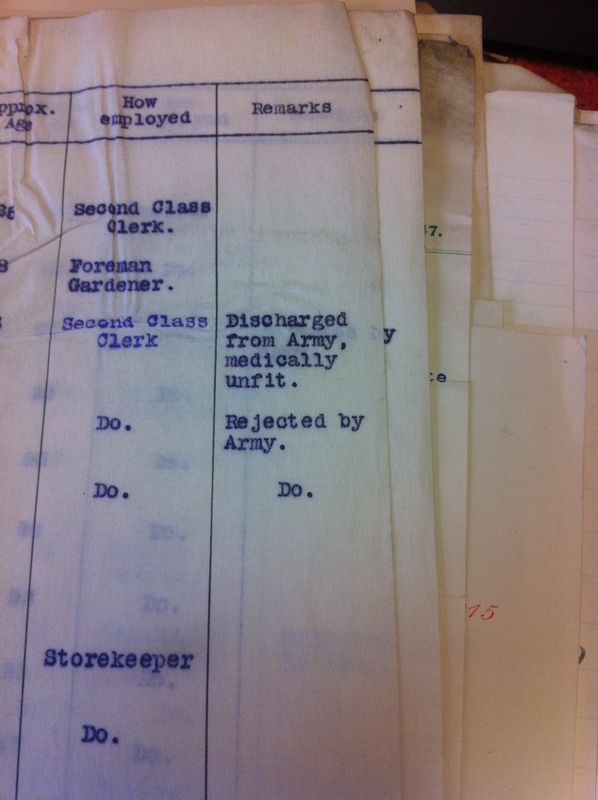 There were 45 applicants, six of whom had their applications turned down as their case was not due to the war. A further six were declined as “undeserving”, and one case was considered both undeserving and not war-related. Fifteen were placed on the unemployment register to help them find work – three of those were given some money in the interim, and in one case it was actually the applicant’s mother who went on the register, whilst in other’s both husband and wife were placed on the register. Some applicants had already found work and their applications were withdrawn. Eight applications were referred to the Soldiers’ and Sailors’ Family Association (who still exist today, see www.ssafa.org ), one to the Putney St Mary’s Relief Fund and one awaited a decision from the Putney Benevolent Society. That left five applications, two of which were adjourned for further investigations and one of which has the intriguing entry of “Chairman to see Borough Engineer and endeavour to get husband reinstated on the Wandsworth Borough Council staff”. Of the 45 applications only two were granted financial help without also having to find work. Gertrude Hannah Brookes was to be allowed 5s per week temporarily and her child was to be fed at school – a somewhat mysterious entry in a few weeks refers to contacting the “Roumanian minister” with reference to her case. Alice Barham was granted 5s for one week and her sons in Canada were to be contacted to see if they could assist. A labourer would have averaged from 14s to 22s a week in 1914, so the amounts being given out were not large, and the fact only five people were awarded any relief at this point shows that it was not an easy process. Less than two months into the war the effects on ordinary people were starting to show, particularly with the amounts of people who were out of work.